The phoenix is a fantastic bird that lives somewhere either in the areas of Lebanon, Syria, and Israel (once the lands occupied by the Phoenician civilization), in Arabia, or in India... as you can see, there was much disagreement on where the bird could normally be found. The phoenix is described as being about the size of an eagle, and having a crest like a peacock’s, a brilliant red breast and throat, with feathers that shine like gold; and towards the tip of its tail, its feathers turn as blue as the clear sky. There is only one phoenix alive at a time, and it lives for around five-hundred years (some ancient authors say 500, others say 540, while still others just say “five-hundred or more”). The bird is aware of the approach of this deadline. When the time comes for the phoenix to die, it builds a nest of aromatic woods ― some say it builds the nest from cinnamon, others say it uses myrrh, cassia, and frankincense ― and then either the nest is divinely ignited by a god, or the phoenix ignites the nest itself by striking its beak against a stone to make sparks. With the phoenix using its wings to fan on the flames, both the nest and the bird are burned to ashes! Not to worry, though... one to nine days later, a new phoenix is born from the ashes of the old phoenix and lives for the next five-hundred years or so. The new phoenix starts as a small worm, that slowly grows to the form of the original bird. This new, young phoenix then creates an egg out of myrrh, and experiments to make the largest egg it can fly and carry. Then the egg is hollowed out, and filled with the ashes of the previous phoenix. This myrrh egg is then delivered to the Temple of the Sun, in Heliopolis, Egypt (some say that the parent phoenix flies to the temple to build its nest there before it burns, which would save the new phoenix a trip). The ashes of the old phoenix are said to have the ability to restore the dead to life! According to the Roman author Pliny the Elder [23-79 CE], the phoenix was brought to Imperial Rome during the reign of Emperor Claudius [10 BCE-54 CE]... except he also adds that everyone knew it was a fake. Pliny states that a Roman senator named Manilius investigated the Arabian legends of the phoenix; his inquiries led to many of the details already stated above, but he also added that the phoenix was considered to be a sacred bird of the sun in Arabia, thus its connection to the Temple of the Sun in Heliopolis. 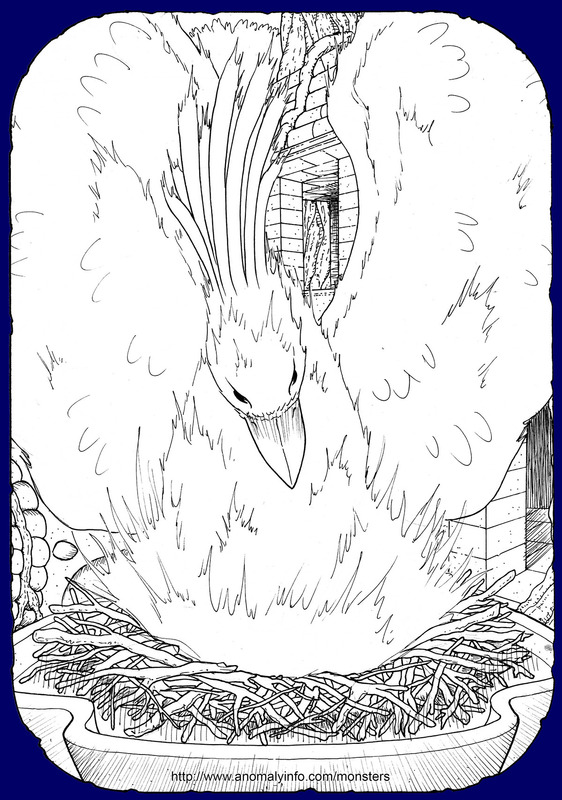 Manilius also mentioned one other oddity about the phoenix; no one had ever seen the bird eat, and there was much doubt about whether it ever actually did. Other ancient authors tell us that the phoenix can quickly regenerate when hurt in any way, thus it was essentially immortal except for its five-hundred year rebirth cycle. This detail probably led to an erroneous belief held by a certain Roman ruler. It has been said that the Roman Emperor Elagabalus [aka “Heliogabalus,“ 205-222 CE] believed that eating the phoenix would make him immortal... which was a strange belief since there is only one phoenix and, clearly, no one had ever eaten one before! Nevertheless, Elagabalus sent some men out to fetch the phoenix. They looked all over, but couldn’t find it. Fearing what the emperor would do to them if they reported failure, they instead brought him a bird of paradise, a beautiful bird found in New Guinea and Indonesia, and told the emperor it was a phoenix. He believed them, rewarded them, and ate the bird. But he probably realized they lied to him a few months afterwards... when he died. "Foreign Birds and English Poets," by Phil Robinson, article in Littel's Living Age, Fifth series, Vol. XL, No. 2001, October 28, 1882, New York, USA. pg. 246. Online: Click here! Histories of Herodotus, The, by Herodotus, translated by Henry Cary, 1904 D. Appleton and Company, New York, USA (copyright 1899). pg. 110-111. Online: Click here! The life of Apollonius of Tyana: Translated from the greek of Philostratus, By Flavius Philostratus, tranlated by Edward Berwick, 1809 J. McCreery, London, England. pg. 179-180. Online: Click here! Natural History of Pliny, The, Vol. II, by Pliny, translated by John Bostock and Henry Thomas Riley, 1890 George Bell & Sons, London, England. pg. 479-481. Online: Click here! Noah's ark; or, 'Mornings in the zoo', By Philip Stewart Robinson, 1882 Sampson Low, Marston, Searle, & Rivington, London, England. pg. 332-333. Online: Click here!